Lets head over to your village centre, so that we can build a warehouse and granary. Don't forget that to go to your village centre, all you have to do is click the button that looks like the little village. This is your village centre. As you can see, the only building is the main building, which is automatically placed when you begin your game. If you look, you can see dark green circles against the light green grass. 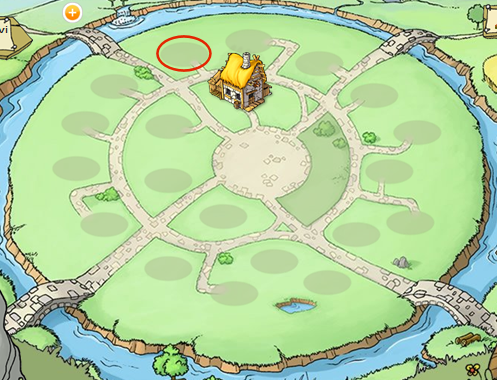 These are building spots for your village, where you can place buildings such as the warehouse and granary. Why don't we build the warehouse first. Click on the spot circled in red. This is a list of all of the buildings you are capable of building. Keep in mind, that there's probably more buildings than you can see. The whole building list was divided into 3 different tabs, each containing different buildings. 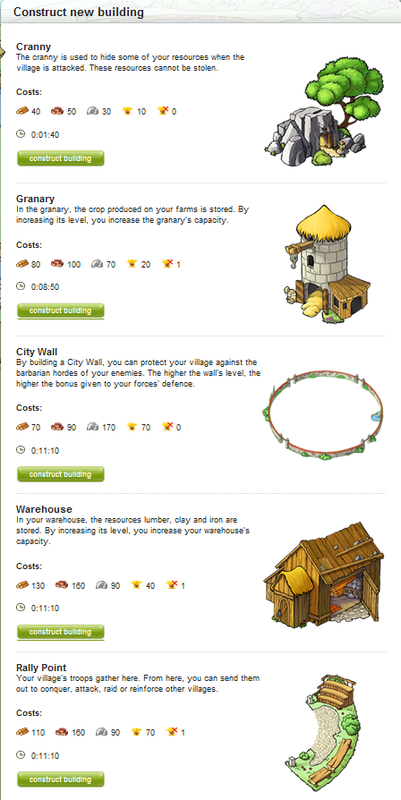 First, Infrastructure, tab contains all buildings, which are reinforcing your village. Crannies, Warehouse, Granary, Town Hall and other similar buildings can be found here. Military tab shows you all the buildings, where troops can be trained or improved. On the list can be found Barracks, Stables or Tournament Square. The last tab is the Resources. There you can find any building which improves your production. Grain mill, Bakery or Brickyard are on that list. As you build and level up more structures, more buildings become available to you. Lets just concentrate on building the warehouse for now. Switch to Infrastructure tab and search for Warehouse. You can see a list of resources and time that you will need to build the warehouse. If you don't have enough resources, just wait an hour or more, but you should have plenty, so go ahead and click the green "Upgrade to level x" under warehouse. You can look at the bottom of the page, just as you did with the cropland, and see that it has started to build a warehouse. It will take about 32 minutes for it to complete, so just take a breather, watch some TV, eat some chips, and come back in half an hour. Woo, enjoy your break? I sure enjoyed mine. Anyway, now you that you have completed a warehouse, lets make a granary. Remember that blue circle? Why don't we build it there. Just click the green "Upgrade to level x" under granary and begin building. Now, if you are of the Roman tribe, I would think going ahead and start upgrading one of each fields would be a good idea, but if you aren't, just wait about 25 minutes for it to finish, then continue to build on your resources until you have 1 of each upgraded to level 1. If you notice, your crop is lower than it was before, because as you build onto your village, your population increases, and as that happens you need to use more wheat to feed your villagers. Always try to keep your wheat production the same as your other productions, as crop is just as important as the other resources and more. Also, keep in mind, that there are multiple tasks, which will construct your building for you. There are tasks, which will finish the building immediately or construct free second level for you. Don't worry, if you miss the opportunity, it will wait for you when you settle a new village. Editor's note: Early on, it can be safe to keep your crop production about half to three-quarters of your highest production, since wheat is not used as much in most building costs.